The DPNE-5 is a high performance digital and analog audio processor. Incorporating the latest in advanced technology, it is ideal for wired and wireless headphone applications. Nearly all controls are automatically set by the processor based upon the audio input. Simply connect the audio input , headphone/speakers and AC , and your DPNE-5 is ready to play. Select the desired audio input and virtual processing on or off. The volume control adjusts the level for both the headphone and speaker outputs. 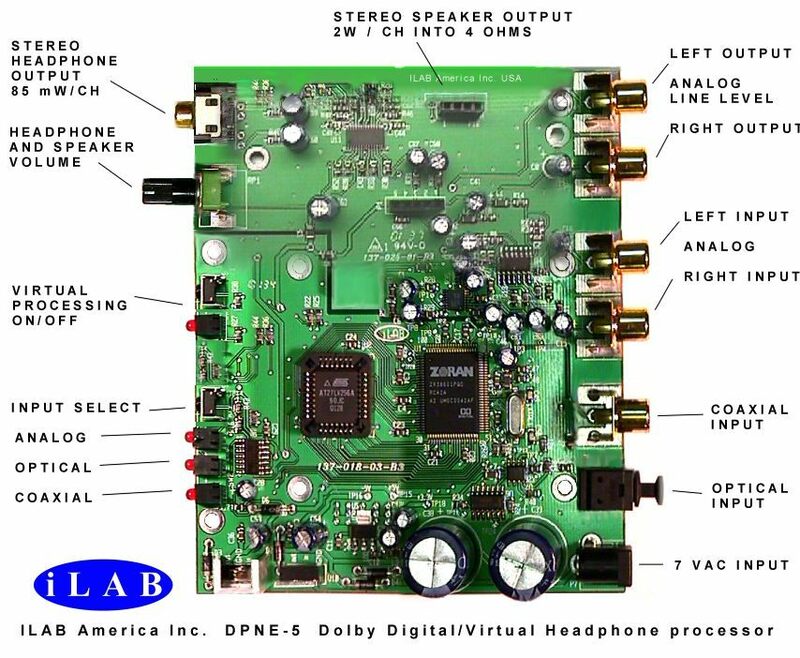 With the headphone unplugged, the DPNE-5 automatically switches to the speaker outputs. PCB size: 4.30" x 5.50"
Speaker: Less than 1% , 20Hz - 20kHz at rated power. Headphone: Less than 1% , 20Hz - 20kHz at rated power.